Welcome to the story section, we hope you will enjoy the wide range of styles and authors represented here. Whilst we wish this site to be as family friendly as possible, we are aware that attitudes to story content vary and what is considered suitable by some will be offensive to others. Parents are therefore strongly advised to check the content of this or any other site they use, before permitting their children to access it. There is a wide variety of authors and styles in this section. To see what they have written click on their story links on the left of this page. Why not send us your story? You never know, it might just appear on this site in a day or two. Just return to The Gloob home page to see how to submit your work. 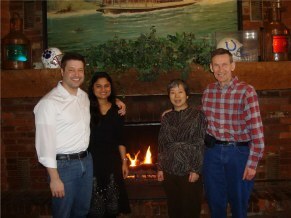 In the Spring of 2008 two of The Gloob's most successful authors - Artie Knapp, children's story writer from the USA and Jack Windsor, short story writer from the the UK met for the first time over lunch at Madison, Indiana. We are delighted to say that both of them have loads of work on this site - why not check it out?